I remember back when we lived in Phoenix, there was a running “half-joke” that if you went down to Mexico (which I actually never did), you didn’t want to buy food from any woman who wasn’t overweight, because it meant she wasn’t eating her own food and therefore, you were at an increased risk of getting food poisoning. Now, while this is obviously an actual risk in Mexico, it’s also poking fun at how fattening mexican food is (which, of course, is it). But, that being said, go into your nearest Mexican food restaurant and take a look around. The place isn’t just full of fat people! There are going to be lots of thin people in the restaurant too! Are these people simply one meal away from becoming fat people? Of course not, they have just mastered that balance thing that I spoke of. They probably exercise regularly and they don’t eat Mexican food EVERY DAY! Yes, there are those people who can eat it every day and their bodies masterfully break it down and they don’t gain weight, but we all know that not every thin person in the restaurant falls into this category. As you’ve probably guessed, I’m still struggling to find that balance. But, my hope lies in an unlikely place: the weather. Fall is coming! Every year, around this time, I find renewed motivation for all things healthy! I started SlimGenics last year right around the 1st of September and spent the winter with an intense focus on learning to eat healthier foods and losing weight. 9 1/2 months and 100 lbs later, I’d say last winter was successful. Now, this fall and winter’s focus will be incorporating that new knowledge into still being able to enjoy the foods I love and exercising. And the best thing of all? I’m starting the journey from a far healthier place than I did last year! Man Vs. Food = David & Goliath! That plate of food makes me hungry!! 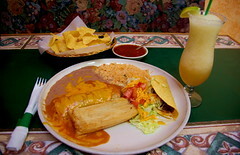 I LOVE Mexican food and have so missed it!! That balance thing comes up again, doesn’t it? I have a friend that I go to lunch with sometimes and she is thin. I always watch her and I notice that she never finishes her food. She doesn’t take it home with her for later. She just stops when she is finished. That is something I struggle with so much. I remember years ago eating lunch with friend and telling her how I was so full while I was eating more. She asked me why I was still eating it when I was full and I didn’t have a very good answer. Self control is HUGE in this balance thing. I am praying I get some of that before I am off the weight loss phase! Yeah, Mexican food is a huge one for me too. I think I could alternate between pizza and Mexican food every night for dinner and be good. Of course, I’d weigh a metric ton! LOL! !